The spring 2019 haute couture shows in Paris have officially come to a close. The prestige of haute couture requires that everything – including the makeup – is innovative, inspiring and memorable. The drama and fantasy of each show last week resulted in drool-worthy makeup looks that are sure to be recreated all over Instagram. Neon eyes, whimsical lashes and wine-stained lips are all on the forecast for this year’s beauty trends. By now, the makeup artists have packed up their kits and headed for New York Fashion Week. Keep scrolling to see some of the most breathtaking looks from the spring 2019 couture shows in Paris. The feather eyelashes at Valentino were undeniably one of the most unforgettable looks from the week. Instagram was flooded with photos and videos of the models batting long wispy lashes with colourful feathers sprouting out of the ends. Every blink looked like flowers blooming. 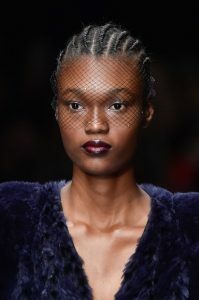 This look was one of many by Pat McGrath during the week. 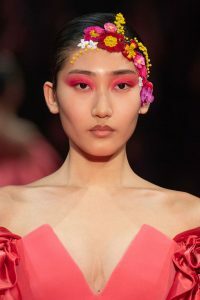 At Alexis Mabille, the models wore a wash of neon pink shadow blended into a gradient right up to the brow bone. The neon trend has been around for the last few seasons, but often with an athletic or futuristic feel. 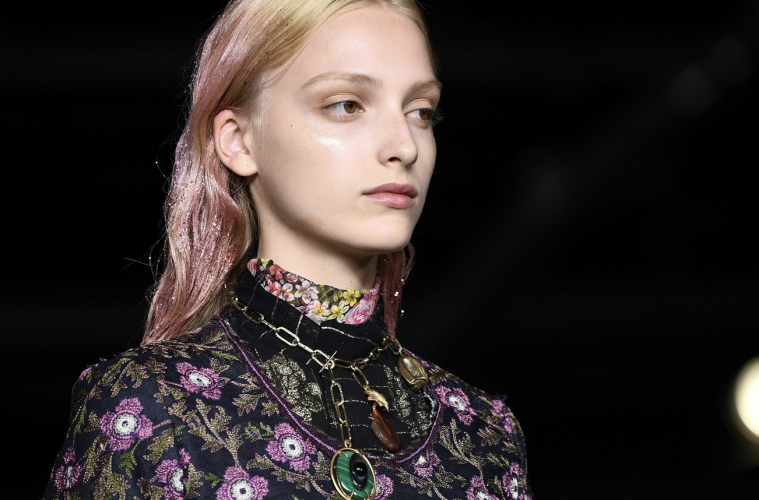 Instead, the soft edges of the eyeshadow created a whimsical mood that was only enhanced by flower detailing in the hair. The models at Paco Rabanne were the embodiment of the dewy skin trend. Ultra-glowy skin flushed cheeks and pulled back hair made the models look angelic. The fresh look was another home run by Pat McGrath. She used her Skin Fetish Highlighter Balm + Duo to make the cheekbones, center of the forehead and chin to make the skin appear dewy. Models turned heads at Azzaro with lips that looked as though they were stained by Cabernet Sauvignon. The stunning blurred effect on the edges of the lips was complimented by minimal makeup on the rest of the face. The fishnet face veil covered in diamantes gave the look the perfect balance between drama and minimalism. 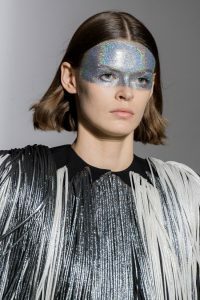 Pat McGrath created iridescent silver eye masks made of glitter on some of the models at Givenchy. On McGrath’s Instagram story, she offered her followers a behind-the-scenes look at how it was done. The first step was to cover the top portion of the face – including eyelids and brows – with silver cosmetic paint. The models sat reclined backward backstage as a loose pigment in the disco-ball silver was pressed on top. Lime green eyeshadow looked more wearable than ever at George Chakra. The colour was diffused up to the brow and blended out in the inner corner with a yellow shade. A thin application of the same green on the lower lash line was grounded with black mascara to keep definition around the eyes. 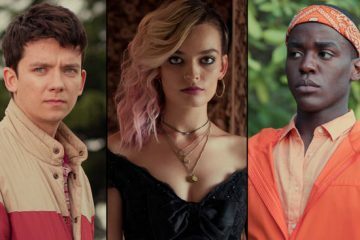 Would you wear any of these looks? Let us know in the comment section. Check out @holrmagazine on Instagram for all of the latest fashion content!